This worksheet tests pupils map skills, with a Christmas theme. It includes direction and latitude/ longitude in addition to using the index. This version has the first letters for most of the questions. This worksheet tests pupils map skills, with a Christmas theme. It includes direction and latitude/ longitude in addition to using the index. This is the answer sheet for the Christmas mapwork sheet. These are the answers to the 40 questions Christmas quiz. This quiz has 40 questions. 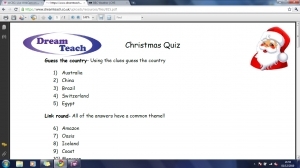 30 of these are Geography based with themes and links with a further 10 questions that are Christmas based.